After we lost our baby years ago I found comfort and peace in many of the words given to us by God in Scripture. I thought I would share a few here for anyone who may find help and hope in them. Some were bathed in my tears, perfect right when I needed them, some needed to work their way into my heart as I grieved, but all of them somehow brought healing in my brokenness and provide that still. At the end of the list is a box where you can download and print the list for your own private use. I hope it blesses you and brings you comfort. "For this child I prayed; and the Lord has granted me my petition which I made to Him. Therefore I have lent him to the Lord; as long as he lives, he is lent to the Lord." "I am weary with my moaning; every night I flood my bed with tears; I drench my couch with my weeping. My eye wastes away because of grief, it grows weak because of all my foes. Depart from me, all you workers of evil; for the Lord has heard the sound of my weeping. The Lord has heard my supplication; the Lord accepts my prayers." "Even though I walk through the valley of the shadow of death, I fear no evil; for Thou art with me." "The Lord is near to the broken-hearted, and saves the crushed in spirit." "Just as you do not know how the life breath enters the human frame in the mother's womb, So you do not know the work of God who is working in everything." "God did not make death, and he does not delight in the death of the living. For he created all things that they might exist." "He will swallow up death for ever, and the Lord God will wipe away tears from all faces, and the reproach of his people he will take away from all the earth, for the Lord has spoken." "Can a mother forget her infant, be without tenderness for the child of her womb? Even should she forget, I will never forget you." "Before I formed you in the womb I knew you, and before you were born I consecrated you." "My soul continually thinks of it and is bowed down within me. But this I call to mind, and therefore I have hope: The steadfast love of the Lord never ceases, his mercies never come to an end; they are new every morning; great is thy faithfulness. "The Lord is my portion," says my soul, "therefore I will hope in him."" "And they were bringing children to Him, that He might touch them; and the disciples rebuked them. But when Jesus saw it He was indignant, and said to them, "Let the children come to me, do not hinder them; for to such belongs the kingdom of God. Truly, I say to you, whoever does not receive the kingdom of God like a child shall not enter it." And He took them in His arms and blessed them, laying His hands upon them." "I consider that the sufferings of this present time are not worth comparing with the glory that is to be revealed to us." "We know that in everything God works for good with those who love him, who are called according to His purpose." "We shall not all sleep, but we shall all be changed, in a moment, in the twinkling of an eye, at the last trumpet. For the trumpet will sound, and the dead will be raised imperishable, and we shall be changed...then shall come to pass the saying that is written: "Death is swallowed up in victory. O death, where is thy victory? O death where is they sting?" "Blessed be the God and Father of our Lord Jesus Christ, the Father of mercies and God of all comfort, who comforts us in all our affliction, so that we may be able to comfort those who are in any affliction, with the comfort with which we ourselves are comforted by God. For as we share abundantly in Christ's sufferings, so through Christ we share abundantly in comfort too. " "For since we believe that Jesus died and rose again, even so, through Jesus, God will bring with him those who have fallen asleep." "I heard a great voice from the throne saying, "Behold, the dwelling of God is with men. He will dwell with them, and they shall be his people, and God himself will be with them; He will wipe away every tear from their eyes, and death shall be no more, neither shall there be mourning nor crying nor pain any more, for the former things have passed away." And He who sat upon the throne said, "Behold, I make all things new."" There are certainly many more Scriptures that can speak to the grief and prayers of those suffering the loss of a child. I would love to have you share here any others that you may have, especially those that may have spoken to your heart in that grief. You can download and print the Scripture list here. This is a very beautiful list and a wonderful resource. Thank you for collecting it here. Thank you for these, it is just what I need to read tonight. I found out this weekend that I am miscarrying and my heart is broken. Oh no. Oh, I am so so sorry for your loss. I'll be praying for you and your whole beautiful family as you go through this pain. My heart hurts for you. Under the "Pregnancy Loss" link at the top there are several great resources if they could also be of any help. May God bless you and carry you through this. Oh, Lucy. I'm so very sorry. It is such a powerless and vulnerable feeling. Sometimes it literally feels like you're heart is breaking. Lifting you up in prayer. May your precious little one rest in Him always and may we meet him or her there someday. Thank you for all you have written - it is truly helping. Thank you for this scripture list. I wrote them down. We just lost our sweet son, Levi Benjamin, 3 days ago. I was 20 weeks pregnant when our doctor found no heartbeat. An ultrasound confirmed that he had passed. Our hearts are broken but I thank God that we know where Levi is, in Heaven with our God. We know, without a doubt, that we will be reunited with him again one sweet day. God bless you. Oh, Eileen. My heart is hurting for you right now. I am so so sorry for the loss of your Levi. What a beautiful name you chose for him! I pray that these words of His will grant you some comfort in your pain. I'll be praying for you and yes, I share that same hope that you will see your precious son again. These verses speak to my heart. Thank you for sharing them. My husband and I went to our appointment today and discovered no heartbeat. We are heartbroken. This was our second miscarriage in six months. But we trust God in knowing that He doesn't make any mistakes. It wasn't our time. Our little ones, though taken so soon, are with Jesus. Praying for you all. I'm so so sorry, Sherri. I'll be keeping you in my heart these next few days and weeks and praying for you. May your precious children be interceding for you now in heaven. This really blessed me. From Monday night to this morning i have been going through the physical pain of a miscarriage. This is my sixth one over the past 18 and a half years. Through each one I have asked why and although I get no verbal answer I feel deep down that the road to a perfect baby is being paved. I am somewhat of the older group. I am 38 years old and have two wonderful sons. My husband has been amazing through each pregnancy. I put my trust in Jesus. Oh, I'm so sorry. That is so heartbreaking. I hope these can bring you some comfort and I will pray today for you. God bless you. Thank you for this wonderful list. I am suffering my first miscarriage after having 4 beautiful children. I am dazed, confused and devastated. I need the Lord's comfort. Your list is exactly what I need right now. I'm so very sorry for your loss. I'll pray for comfort during such a difficult time. That's exactly what my husband and I are going through right now. We have 4 beautiful babies, and going through our 1st miscarriage. This is so hard! I'm so sorry, Marie. It is so so hard. May God grant you comfort and healing and may that precious little saint be praying for your family. Love these prayers had a miscarriage in July 2015 after trying for over 2 years I have 2 wonderful boys but wanted to try one last time & never thought these would ever happen to me feeling this pain in my heart of lossing my baby is very heartbreaking and don't know why God blessed us and then takes your baby away but like my little one tells me we have a angel watching over us but trying to conceive again and have just been praying and praying that our heavenly Father will bless us with a healthy baby. I'm so sorry, Lisa. The pain is so very hard sometimes. God doesn't will death but He does allow it due to original sin. But I have to remind myself that these moments on earth are only a blink compared to eternity. May your precious little saint be praying for you and helping you meet him or her again someday in heaven. I'll pray for you. This is my favorite list of scriptures for processing loss. We lost our daughter Hannah during the second trimester in August of 2014. I was at a teaching conference and with no warning I started hemorrhaging. There are moments when I still feel so shocked by the suddenness of it. Pregnancy after a loss is also rather terrifying. I found out in February of this year that I was expecting again. Our beautiful baby boy arrived in October, but this joy doesn't replace the grief of the loss. People think you are crazy, but you can experience both emotions at the same time! I just miscarried Saturday. This is my third one. I was nine weeks this time, 3 1/2 months last time and just four weeks the first. Where there was two hearts beating, there is now just one very broken heart. I have two beautiful boys, 7 & 3 that need me. This will make me a better mother to them, but I'll never forget the ones lost, it's like I felt them leave me. God will carry me through once again. May God give you comfort and peace, Lucinda. I'm so so sorry for the loss of all your precious babies. Hey Mary - thank you for posting this. My wife miscarried about a couple months ago. We literally found out we were pregnant a week after my father passed away. Then a couple weeks after that, she miscarried. These verses really helped me and I just shared them with her. Do you have any resources for husbands in terms of support advice, etc as we go through this journey? Oh, wow. That must've been so difficult to go through so much all at once. I'm so sorry. I asked around and a friend suggested the book A Grief Unveiled by Gregory Floyd. I haven't read it myself but she said although the author of the book lost his 6 year old, it would also be applicable to those who have lost an unborn child as well. I hope these help a bit. Again, I'm so sorry for your loss. Hi Mary, this list of scriptures is a blessing. My husband and I waited and prayed for a baby for so long. Then one week after our very first OB appt we found we lost our very first baby. 7 wks, 5+days. They couldn't find a heartbeat. Our hearts are hurting but we are comforted. I know everything God does, He does well. Requesting prayers that we grieve w/peace and enter into our next pregnancy w/joy. Free from fear as God is well able to perform all that He has said.. I'm so so sorry, Kiara. I'll be praying for you and your husband. All the time God is good even when it hurts. I'm so sorry for the loss of your grandchild, Cindi. The loss of a baby certainly affects the whole family. May He use this cross to bring you all closer to His love and resurrection. I am going through the worst 3 months of my life. Jan 14th I had a miscarriage. Today exactly 3 months later I went for a ultrasound at 9 weeks and was told my baby has no heartbeat but hasn't told my body to get the baby out. I feel horrible, lost, confused, and heart broken. I don't know what to do.. I've been crying since I left my ultrasound and I feel so lost. These scriptures are great even though I cry while reading every one.. thank you! Oh, I'm so so sorry for the loss of your babies. Your poor heart must be hurting so much. I'll be praying for you. May those precious little babies be in heaven praying for you, too. I'm so very sorry for the loss of your babies. It's true that it becomes a sort of initiation into the group of other mothers who understand the pain and grief. May God grant you peace and comfort. Thank you! Not sure how that got by me! I love your suggestion and what a gift that that was given to you at such a difficult moment. I'm so sorry for your loss. The book of Wisdom is from the deuterocanon meaning it's one of the seven books recognized by the Catholic Church as Scripture but not by many Protestants. It's a beautiful book. I'm going through a miscarriage right now and my heart is breaking. Yeah I know I'm young but it still hurts like he**. Thank you for these scriptures. I literally just found out hours ago that my fourth little baby will stay with Jesus. I am so heartbroken but we have three babies and continue to see God's blessings. I fear the process and the pain is great but the Word of God will see me through. Thank you and God bless you for this. I'm so very sorry for your loss, Meshel. I will say some extra prayers for you and your family. I miscarried at 23weeks a week ago. I felt like God hit me very hard thus time around. It is devastating I cannot go a day without thinking about my boy. Thank you for the scriptures. Oh, I'm so sorry. So very sorry. I'll be praying for you. May your little boy be in the presence of God and watching over you. I hope they can help a tiny bit with the heartache. I'm so so sorry for your loss. Thank you for this post of uplifting scripture. On April 15, 2016 we went for our big 20 week ultrasound to see our sweet baby. Myself, my husband and our 2 little girls (10 and 7) only to be told that our baby did not have a heart beat. That might I delivered our precious and perfect baby boy....Ryker Kyle Smith. We were all so heartbroken but so thankful that we got to hold him and love on him and hurry him in the cemetery that is only a mile away from our home. Mid June I learned that I was pregnant again (even tho we thought we had prevented conception) but at 6 1/2 weeks I miscarried. We are all heartbroken again and I'm just so confused. I have grown up in a Baptist church but I really like the scripture that you put in from the Catholic beliefs from wisdom. I know that God doesn't take our babies but that bad things happen bc of the horrible sinful world we live in. Oh, I'm so so sorry for the loss of your babies, Juleigh. How horrible. May Ryker and his little brother or sister now be in the Presence of God. May God bring you comfort and understanding and peace. I'll pray for you. I miscarried a few days ago for the first time. I can't seem to stop crying every now & then. I tried to stay positive & relax. I was so looking forward to my 4th pregnancy. I miscarried at 5 weeks. I am 36 years old. It really hurts. It felt like a piece of my heart expelled from my body. I felt like I am in a cold & dark corner away from everyone. Was once in a sunshine, happy & excited! Now came to a halt to throw me back in the cold & dark place where nobody is. I feel broken. I am having trouble eating. I am not taking this very well. I am supposed to be 6 weeks this Thursday. Empty womb that's all. More like an empty hole on my womb. Your Scriptures are helpful. Oh, I am so so sorry. It does hurt so very much and everything you are feeling makes sense. I'll be praying for you. You will never forget but the rawness of the grief softens with time. Let yourself feel what you need to and let these Scriptures soak in your heart and work to heal. Thank you so much Mary. May God bless you! I am currently going through my first miscarriage. I have a beautiful, perfect daughter, and have been praying to get pregnant for a while now hoping to give her a sibling close in age to her. I am 29 and have been a Christian since I was a child. I am even in seminary now and still have the urge to question why this would happen and what I could have done wrong. I know my baby is in God's hands now and I can't wait to meet them someday, but it doesn't ease the heartache and tears now. I don't even have an ultrasound picture to remember them by since I was only 5-6 weeks. Thank you for the encouraging verses that is exactly what I was looking for. I pray for all of you who are going through the same heartache of a miscarriage, I never want anyone to have to experience this. I'm so very sorry for the loss of your baby. I don't think it's wrong to ask questions in our grief. For me, at least, the grief and heartache and sense of this not being how the world is supposed to work help prove that we are made for more than what this life offers and that there was an original plan that went wrong. (If that makes sense!) I'll pray for you. I'm so sorry. Thank you for this list of scriptures. 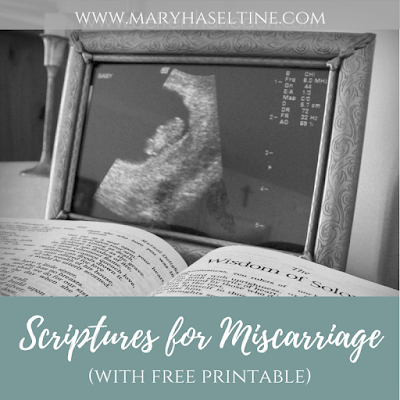 We have had a 22 week miscarriage in the family this week and as the only Christian (that I'm aware of) I wanted to find a resource that I can hopefully share with the others, especially the mother, as I don't know if they have a faith but I want to do everything I can to encourage them and use Gods word to bring them comfort. Thanking God that he has that precious baby boy wrapped in his loving arms right now. Thank you Mary for putting this together. God bless you. Oh, I'm so sorry for your family's loss. I hope His words can bring all of you some comfort and healing during this time. Mary, thank you for this wonderful list! My husband and I just went through our second miscarriage in six months. With our first loss, the Lord told me we lost the baby before we found out at our 8 week ultrasound and His peace and comfort was great. But this time it has been much more difficult both physically and emotionally as we were further along. Such a heartbreaking thing to go through and wish it upon no one. Praise the Lord for His Word and the comfort it brings! One passage that the Lord kept putting on my heart during this was Psalm 139:13-17. "For it was You who created my inward parts. You knit me together in my mother's womb. I will praise You because I have been remarkably and wonderfully made. Your works are wonderful and I know this very well. My bones were not hidden from You when I was made in secret, when I was formed in the depths of the earth. Your eyes saw me when I was formless, all my days were written in Your book and planned before a single one of them began. God, how difficult Your thoughts are for me to comprehend; how vast their sum is!" It brought me so much comfort knowing the Lord saw my babies before they were formed and they are written in His book. Although we did not have the privilege of meeting them in this physical life, God created them, they are named and they are a part of our family. We are excited to meet them one day. Hi Erika, thank you so much for sharing that full verse. It's so beautiful and so comforting to know that even if the world never sees our babies, God knows them and loves them infinitely. I'm so very sorry for your losses. Thank you for sharing the scripture list. I just suffered a 23wk loss, last week. It came out of no where and shocked us all. I'm trying to find solace in these beautiful verses as to not blame myself for the loss. This is my first miscarriage. But we are hopefully and will try again to complete our family. Oh, Nina. I am so very sorry for the loss of your baby. How heartbreaking. May God grant you peace beyond human understanding. I will pray for you and your family. I'm so very sorry for the loss of your babies, Berenice. I will pray for you! This is a beautiful list. And the verse from Wisdom is particularly helpful as I too have been confused hearing all about "God's will" after losing our little Matthew Joseph at 18 weeks a few days ago. I'm so sorry for all of you who have experienced this as well and pray that we all find some peace until we see our little ones again! I just had a loss around 8 weeks. This is our 2nd loss in 3 months. We are devestated! This time around I am so scared I’ll never hear a newborn cry ever again. I am struggling to understand God’s will in all if this and I feel so abandoned by God right now, but I keep reminding myself that He sees the big picture and that there must’ve been a reason for all of this that we may never understand in this lifetime. I am comforted by a thought that I’ll see my babies in heaven one day. Thank you so much for your comforting words and, especially, for your prayers!! Just a quick question aboout progesterone - I haven’t had issues with it in the past. Could I have developed it all of a sudden? Yes, it's definitely something that can come and go. I obviously don't know if that's the case for you, but for some reason felt like I should bring it up, just in case it is. It's worth ruling out, at least. I'm so sorry. Please, continue to pray for us! Thank you for posting this list of Scriptures, Sister. I have found some comfort in these words, and in the comments from others. My wife miscarried a bit more than a month ago, and I am still occasionally broken anew by the hurt of a lost little one. She was 10 weeks along when it happened. We do have 2 other children, and we are talking about trying again a little down the road. Sometimes, it is hard to be the rock for the rest of the family, even when you yourself feel like everything is crumbling around you. But Faith sustains us all, and Jesus takes all our burdens, so that we can continue to be about the Father's business, even when we can barely see through our own tears. I'm so very very sorry for the loss of your precious baby. May Our Lord give you comfort and peace and may your son or daughter in heaven be interceding for your whole family.